Cotoletta (Italian pronunciation: [kotoˈletta]; from costoletta = "little rib", because of the rib that remains attached to the meat during and after the cooking) is an Italian word for veal breaded cutlet. 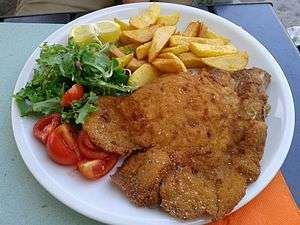 Cotoletta alla milanese (milanese after its place of origin, Milan) is a fried cutlet similar to Wiener Schnitzel, but cooked "bone-in". It is fried in clarified butter only and traditionally uses exclusively milk-fed veal. Cotoletta a orecchio di elefante ("elephant ear cutlet") is another type of milanese, launched in recent years by trendy Milanese restaurants. This version uses a thinner but larger cut of meat, and is deboned and tenderized prior to frying, similarly to the American preparation of breaded pork tenderloin and chicken fried steak. This is the most common cotoletta eaten in Italy in everyday life because it is easy and fast to prepare. In the typical osteria in Milan the first version is much more common. Cotoletta alla palermitana (palermitana because it takes origin from Palermo, Sicily) is similar to a milanese but the veal is brushed with lard or olive oil instead of butter, and then grilled instead of being deep fried. The breadcrumb is very often mixed with oregano and/or Parmesan cheese, and it can be put on the grill upon a leaf of lemon that gives it a particular Sicilian scent. This cutlet is the only one among its "sisters" (tonkatsu, schnitzel, milanese, American style breaded meat, etc.) that does not have eggs in its breading.